Dennis Gilmore and Holger Levsen will present about “Reproducible Builds and Fedora” at Devconf.cz on February, 27th. Reproducible Builds have been mentioned in the FSF high-priority project list. The F-Droid Verification Server has been launched. It rebuilds apps from source that were built by f-droid.org and checks that the results match. Bernhard M. Wiedemann did some more work on reproducibility for openSUSE. Bootstrappable.org (unfortunately no HTTPS yet) was launched after the initial work was started at our recent summit in Berlin. This is another topic related to reproducible builds and both will be needed in order to perform “Diverse Double Compilation” in practice in the future. Ximin Luo researched data formats for SOURCE_PREFIX_MAP and explored different options for encoding a map data structure in a single environment variable. He also continued to talk with the rustc team on the topic. Daniel Shahaf filed #851225 (‘udd: patches: index by DEP-3 “Forwarded” status’) to make it easier to track our patches. Chris Lamb forwarded #849972 upstream to yard, a Ruby documentation generator. Upstream has fixed the issue as of release 0.9.6. Alexander Couzens (lynxis) has made mksquashfs reproducible and is looking for testers. It compiles on BSD systems such as FreeBSD, OpenBSD and NetBSD. 13 package reviews have been added and 13 have been removed in this week, adding to our knowledge about identified issues. Code quality and style improvements. Support comparing .ico files using img2txt (Closes: #850730) and fixes and extra tests in subsequent commits. And other code quality and style improvements. Ximin Luo and Holger Levsen worked on stricter tests to check that /dev/shm and /run/shm are both mounted with the correct permissions. Some of our build machines currently still fail this test, and the problem is probably the root cause of the FTBFS of some packages (which fails with issues regarding sem_open). The proper fix is still being discussed in #851427. Valerie Young worked on creating and linking autogenerated schema documentation for our database used to store the results. 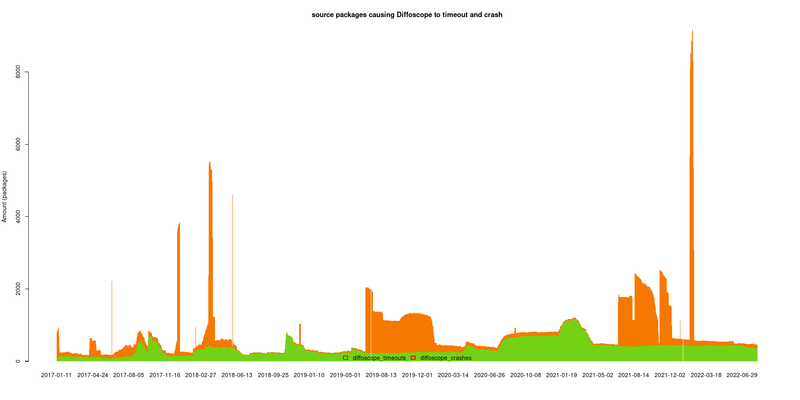 Holger Levsen added a graph with diffoscope crashes and timeouts. Holger also further improved the daily mail notifications about problems. This week’s edition was written by Ximin Luo, Chris Lamb and Holger Levsen and reviewed by a bunch of Reproducible Builds folks on IRC & the mailing lists.